Behind 39 points (9-26 FG), 8 rebounds and 3 steals from Paul George, the Thunder defeated the Magic tonight in Oklahoma City by a final score of 132-122. Additionally, Russell Westbrook registered his 7th consecutive triple-double with 16 points, 15 rebounds and 16 assists in the victory. 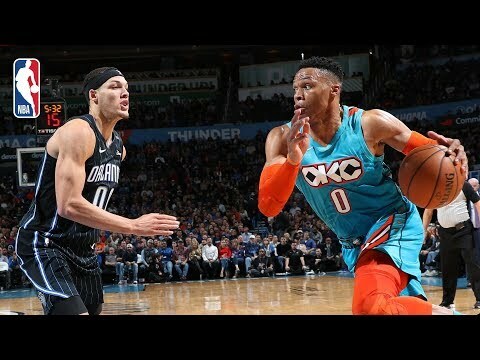 Westbrook has now tied his longest career streak of consecutive triple-doubles (third time in his career he has recorded 7 consecutive) and is now two consecutive triple-doubles behind Wilt Chamberlain (9 straight from 3/8/1968-3/20/1968) for the most consecutive triple-doubles all-time. Terrence Ross led the Magic with a team-high 26 points (8-18 FG), to go with 5 rebounds and 3 steals in the losing effort. With the win, the Thunder improve to 34-19, while the Magic fall to 22-32 on the season.